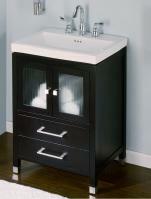 The top of this single sink vanity is cut so that it holds the outward curvature of the apron style sink bowl. 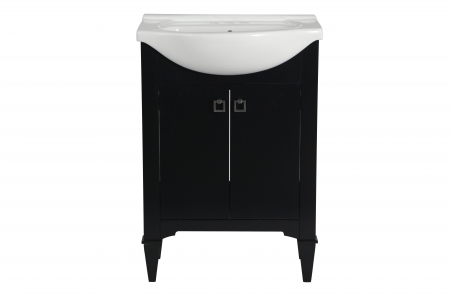 This creates an amazingly bold look for the piece that is sure to make an impact on the space. The dark espresso finish of the base contrasts nicely with the white porcelain sink material. 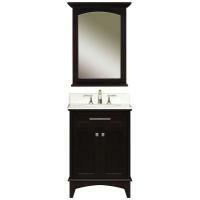 At just two feet in width, this small vanity will be perfect for a smaller or odd shaped bathroom. 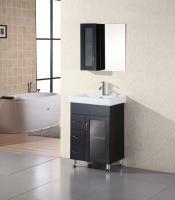 The double door cabinet provides a nice area for storage in the bathroom which is always welcomed.